Unfortunately, little Catalina will never know the wild life she was born to live. Born in the summer of 2017, she was a tiny kitten when she was found by a well-meaning person. She was kept and handled for a few weeks before she was turned over to authorities. While that might not seem like much time, it was long enough to change the course of her life. 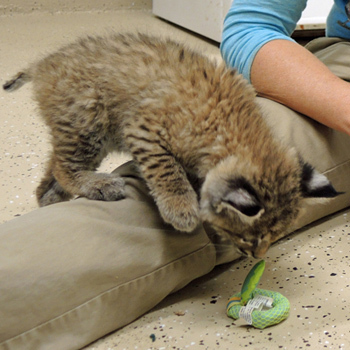 Catalina arrived at Southwest Wildlife purring and wanting to play, rather than hissing and afraid of people. A wild carnivore without appropriate fear of humans cannot survive long in the wild. Catalina now lives with four adult bobcats who are permanent residents at the sanctuary. Most of the time they’re patient with her busy, young bobcat energy. She thinks she has no boundaries, so occasionally, she needs some instruction from her elders. Catalina is not releasable and will live out her life at our sanctuary. Please, if you find any wild baby, before you attempt to “save it,” contact a licensed wildlife rehabilitator in your area. 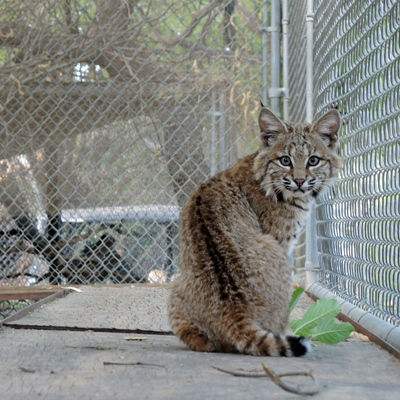 Catalina is one of many bobcats living at Southwest Wildlife that are non-releasable. Your support of Catalina will not only help her to live a healthy, happy life, but will support all the bobcats who call Southwest Wildlife home. Catalina's education at Bobcat School included Bobcat Manners 101, taught by Winslow. Enjoy!